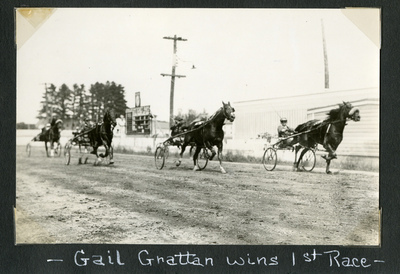 Black and white action photo of the finish of the first race of the Oxford County Fair, Norway and South Paris, Maine, on Tuesday, July 21, 1936. Bay mare Gail Grattan (listed in the program as Gail Gratton), Dennison up won the heat. Mable Junior finished in second place. Symble Lucy and Billy the Kid finished in third and fourth place.